Just Comment: A shift toward something new? "Numbers alone do not capture the sense that the balance of global economic power is shifting eastward. There have been several moments that seemed to crystallize the zeitgeist, none more memorable than U.S. Treasury Secretary Timothy Geithner's speech in June before the best and brightest at Peking University, the Harvard of China. Not long ago, students there would have been the most respectful and polite of audiences. Yet when Geithner tried to reassure one questioner that China's investments in U.S. government debt were "very safe", the response was perhaps an indication of the onset of a new economic order: the students laughed." Are we witnessing a global shift in economic and political power? What of the emerging economies of Brazil and India? How will they change the economic and political landscape of our planet? What do you think it could mean for New Zealand? 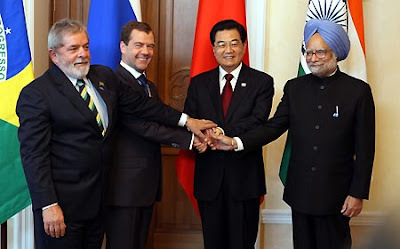 What do you think of the fuss being made of India and China fueling a global economic recovery? Recovery of what and to what? What do you think it could mean for our pursuit of social justice?